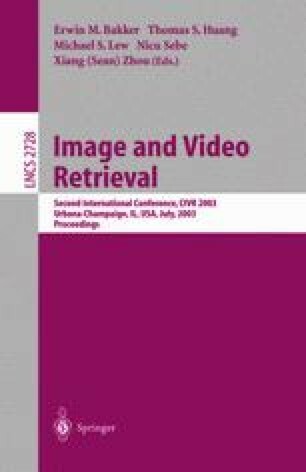 The paper describes a fast system for appearance based image recognition. It uses local invariant descriptors and efficient nearest neighbor search. First, local affine invariant regions are found nested at multiscale intensity extremas. These regions are characterized by nine generalized color moment invariants. An efficient novel method called HPAT (hyper-polyhedron with adaptive threshold) is introduced for efficient localization of the nearest neighbor in feature space. The invariants make the method robust against changing illumination and viewpoint. The locality helps to resolve occlusions. The proposed indexing method overcomes the drawbacks of most binary tree-like indexing techniques, namely the high complexity in high dimensional data sets and the boundary problem. The database representation is very compact and the retrieval close to realtime on a standard PC. The performance of the proposed method is demonstrated on a public database containing 1005 images of urban scenes. Experiments with an image database containing objects are also presented.